Today I will make the trip to Massawa, to join the group of Italians and Tedros and Doris of Travel House International and Eritrea Tours for the visit to the Dahlak Islands. Clouds surround the mountains between Asmara and Nefasit. It is like riding through fog. Yerusalem, a female teacher from Asmara sitting next to me, tells me this is a usual phenomenon in November. It is winter in Eritrea. I have to plan a hike to experience this on foot one of these days. After Ghinda the sky is blue and the temperature is rising. We both fall asleep, not to wake up until we reach Massawa. The bus stops at a regular interval. I get off when it turns to the right, last stop before the bus terminal and roughly follow the railway line, that will go all the way to the port district of Massawa. It is hot, but in winter, and still early, bars and shops on both sides on the road, I prefer to walk the last three kilometers to the Red Sea Hotel, where the group of Tedros is staying. The Red Sea Hotel is recently build, modern, clean, and expensive, but it will be easy to communicate with Tedros. After checking in, I walk to to next island, the old port area. In a small bar, still on the Tualed Island I drink a few cups of tea, trying to start a conversation with a young girl that is managing the place on her own. There is only two visitors in her bar. It is noon and most people are resting. The girl tells me I should rest, instead of proceeding my walk. No time to rest. There is two wedding ceremonies today. Two tents, women preparing suwa and food. I meet Martin and Sylvia, who are in Eritrea to visit their daughter working for the Red Cross in Asmara. With them I spend the rest of the afternoon, beers, dinner in restaurant Eritrea, and when it gets dark we explore downtown Massawa, drinking Araki and enjoying the Eritrean music on a terrace. We end at the two wedding ceremonies. I challenge Martin and Sylvia to enter the tent, where we witness the music, the singing and the dancing of the guests, congratulate the just married couples and enjoy the enthusiasm of the people. 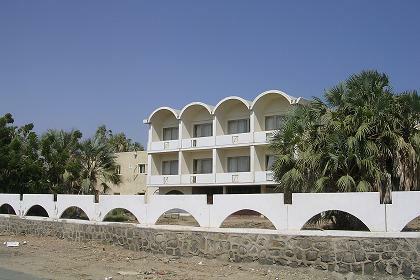 Red Sea Hotel Massawa Eritrea. 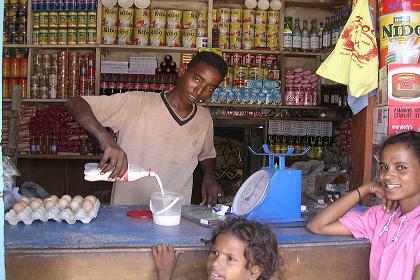 Small grocery store - Massawa Eritrea. 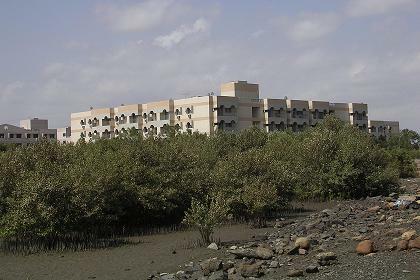 Mangroves & Massawa Housing Complex - Massawa Eritrea. 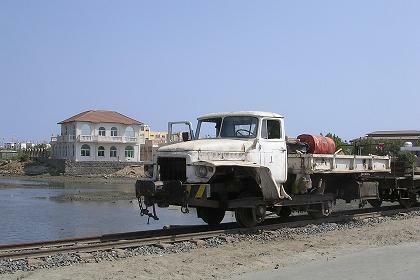 Railways maintenance car - Massawa Eritrea. 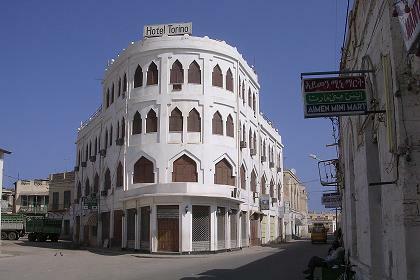 Torino Hotel - Massawa Eritrea. 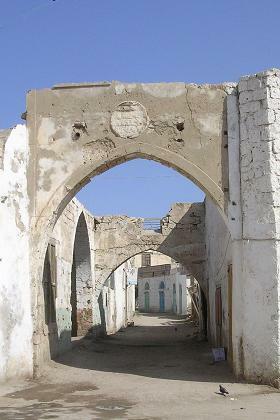 Traditional alleys - Massawa Eritrea. 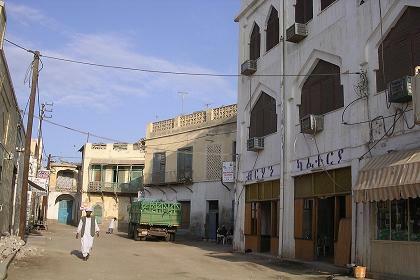 Offices and shops - Massawa Eritrea. 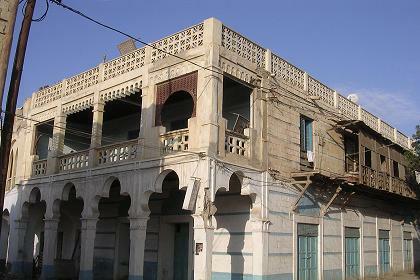 Shops and apartments - Massawa Eritrea. 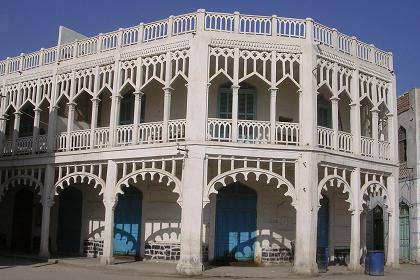 Traditional building - Massawa Eritrea. 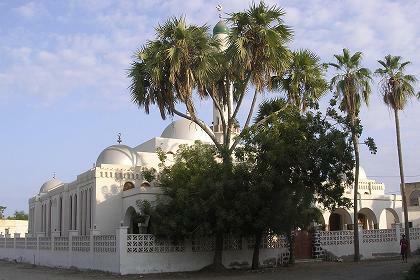 Grande mosque - Massawa Eritrea.